Indi Graffiti | OK Listen! 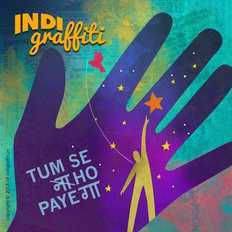 Indi Graffiti is a Hindi graffiti Rock (Yes! that’s a genre!) band from the pub capital of India. The band brings together an amalgamation of free artistic expression with sincere lyrics and simple yet soulful tunes with the power of good ol’ rock n roll. This genre of free artistic expression brings about the very origins of the name Indi Graffiti and of the genre Graffiti Rock. Formed in late 2007 under a different name and hood, the band began writing and composing original music blended with Hindi lyrics. The music evolved over a period of time and it eventually came to the shape and form it is in today, which is 80’s-90’s rock, infused with Carnatic and Hindi pop-rock elements. Having played in multiple venues in Bengaluru and across the country, dishing out a 100% original set, Indi Graffiti has generated a subtle yet loyal fan following. Indi Graffiti is a four-piece collaboration with years of composing and performing experience under its badge.